Some shaped on the top along with dark blue color fabric this Designer Pergola Tent is ideal for adding charm to any exterior. Designer Pergola Tents exhibit the luxurious and lavish touch to your events. Increasing the beauty of the places, these tents are designed with the meticulous efforts of our designers. Backed by vast experience in the profession of tent manufacturing, Kirti Tents was established with a mission to promote beautiful handcrafted tents in the Indian and International market. From development and design to installation and maintenance we have every aspects covered at Kirti Tents. Our company has managed to develop a global presence through exports of Tents and marquees. 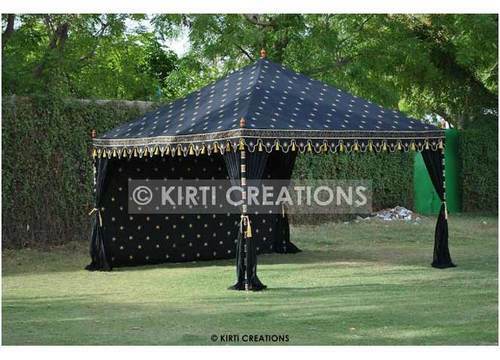 Kirti Tents offers a wide range of elegantly designed tents that are rich in style, design, pattern and quality. Tents that we manufacture come with all the essential accessories like wooden poles, wooden / iron pickets, tie and guy ropes, flooring etc. and has a proper pitching plan. Our all-weather tents have 100% cotton interiors to provide highest level of comfort. We also offer custom designed tents with exclusive prints, logos and embroidery to meet the changing requirements if the clients..
We emphasize on finding new ways to improve the efficiency and the quality of the product we deliver. Our skilled workers are groomed to have a positive approach toward handling even the toughest of situation. It is with the continuous support and dedication from our team and state - of the - art infrastructure, we have managed to achieve sustained growth and enhanced infrastructure facilities to maintain the company's reputation. At Kirti Creation finding new ways to improve the efficiency and quality of the product has become a practice. We vie on providing the best quality tents to our clients, who are spread across the globe and are increasing day by day. Our low cost and low maintenance tents are very popular in the market and are made as per international standards.